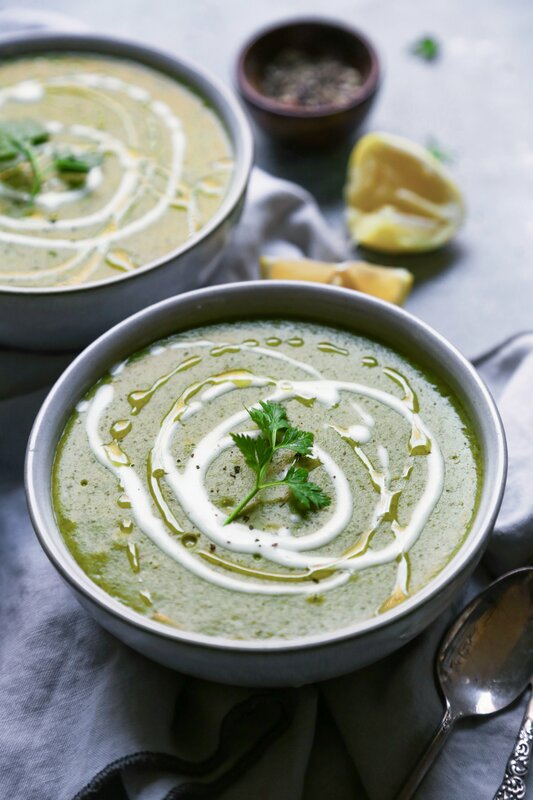 This Creamed Broccoli & Spinach Soup is easy to make and so flavorful! It’s also free of gluten, grains, & dairy; paleo & vegan friendly as well! Soup is a food I could eat all year long. Hot or cold, rain or shine. They’re comforting, hearty, and pretty easy to throw together. My favorite soups are chock-full of wholesome veggies, which makes them both healthy and satisfying. I love using Taylor Farms products because they’re always so fresh and ready to eat right out of the package. Their line of organic vegetables, including broccoli, green beans, and sugar snap peas, come in microwaveable bags and are perfect for quick sides, veggie platters, or to add to recipes. The fact that they’re pre-washed and ready to use really cuts down on food prep and makes cooking a breeze! 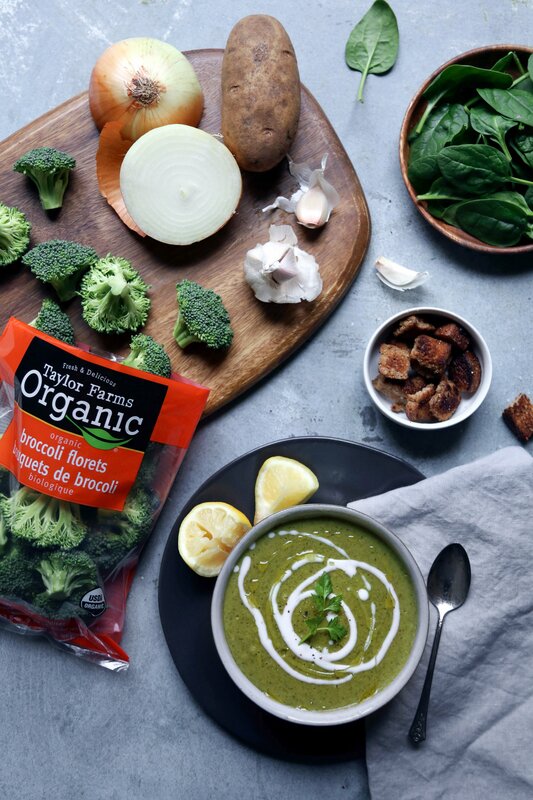 I used Taylor Farms Organic Broccoli Florets to make this creamy soup, along with onions, potatoes, garlic, and spinach. It’s very simple, but what really enhances the flavor is roasting the broccoli before adding it to the soup. Roasting adds a delicious depth of flavor as it brings out the natural sweetness of the vegetables and also incorporates those yummy caramelized bits. It’s one extra step, but well worth it, in my opinion! Just blend up the cooked soup to get that creamy finish. Stir in some plain yogurt and a drizzle of olive oil or top with some homemade croutons, which I make by pan-frying bread cubes with a little butter, salt and pepper. The soup is wonderful alone, but would also be great with some warm, crusty bread or one of Taylor Farms salad kits! Are you a soup person too? Let me know your favorites in the comments below! Enjoy! and pepper. Toss to combine. Place pan into the preheated oven for 15–20 minutes, just until broccoli is lightly browned. broccoli, onions, garlic from the pan and enough broth to cover, about 2–3 cups. tender, about 10–15 minutes. Turn off the stove. Add spinach and stir to wilt. Season with a generous pinch of salt and pepper. necessary, to blend. Stir in lemon juice, to taste. Pour soup into bowls and swirl in plain yogurt and a drizzle of olive oil. Makes 2–3 servings. This post was sponsored by Taylor Farms, but all opinions are my own. Thank you for supporting the brands that support Wife Mama Foodie! What a delicious creamy soup you have here, Joscelyn! I am so happy I stumbled upon your blog. Your recipes are finger-licking! I’m craving all the cozy bowls of soup – this looks perfect! Looks good! 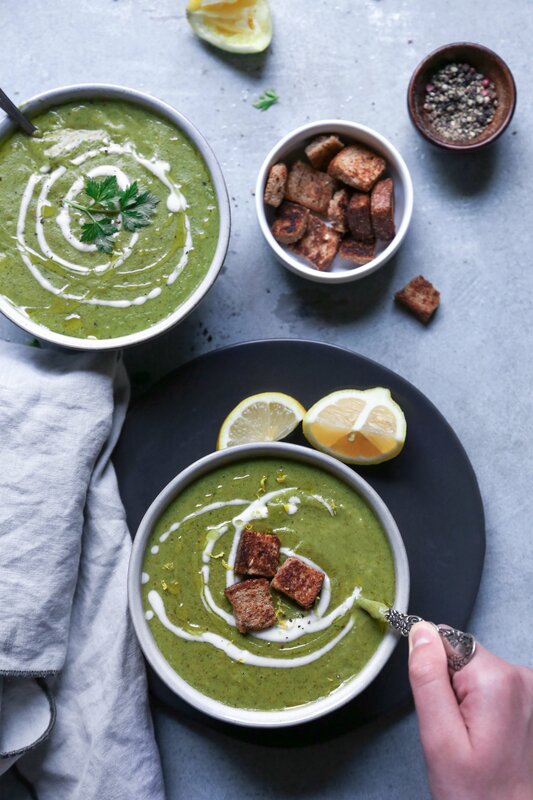 I’ve never made broccoli soup before but this combination looks seriously delicious! I really love soups too and this one looks amazing! Broccoli is also my favourite vegetable so i’m gonna give this a try! Pinning it! This soup looks amazing! I love all kinds of soup, and broccoli is one of my favorites. In looking over the ingredient list, I was so pleased that there is no cream listed, which means this soup is diet friendly too! These all look so yummy! I’ve been on the hunt for new dinner recipes lately and I never thought to make soups! I’ll have to try this recipe this week. Thanks for giving it a try Keating! This looks amazing! We love making soups at home, especially since we are cooking on a budget. Looks delicious! Broccoli is one of my favorites, but I’ve never had much luck with it. I will have to give your recipe a try! I love vegetable soups. My mom made an asparagus one and I am going to show her this one too! This looks so healthy and delicious!! Cant’t wait to try it out! This sounds SO delicious and easy to make! I cannot wait to try it! 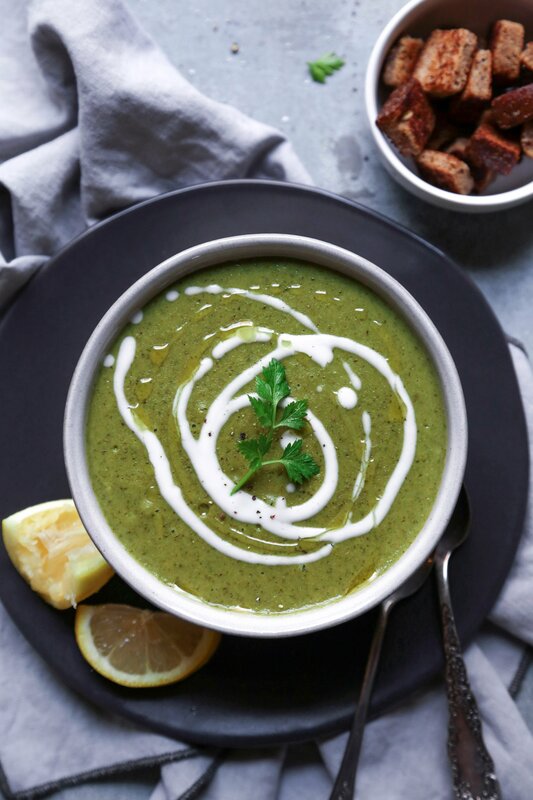 We love a nice thick creamy broccoli soup but never thought to add spinach. Love this idea, will be trying this out. This all looks delish! I’ve been on a major soup kick lately!